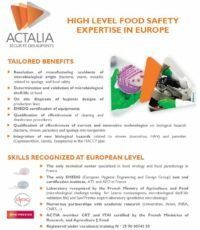 The vocation of ACTALIA Sécurité des aliments [Food Safety] is to provide agri-food companies with expertise (analyses, testing, consulting, training) to help them to ensure microbiological food safety and hygiene. 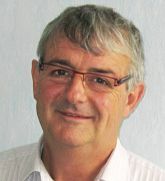 This expertise (contractual and confidential) is based on skills developed within the framework of national and European R&D projects undertaken in collaboration with public microbiology reference laboratories (ANSES, INRA, CNRS, Universities…). … A 230 m2 biosafety level 3 pilot plant, open to public and private research, to assess the effectiveness of food proces-sing technologies and cleaning/disinfection procedures on pathogenic or spoilage microorganisms in the food industry. ACTALIA’s recognition: Only technical centre in France specialized in food virology and food parasitology.